Looking for EASY Easter Recipes with Raspberries? 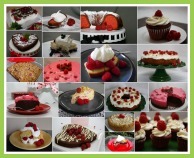 Here are a variety of recipe ideas with fruit for Easter Brunch, Dinner and Dessert. 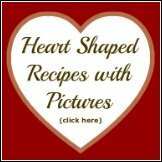 Recipe ideas that are both quick and easy to make ... anyone can make them! Whether you are having a traditional Easter Celebration Dinner, or you are searching for new Easter Recipes, you will find a variety of ideas here to help you enjoy this time with family and friends. 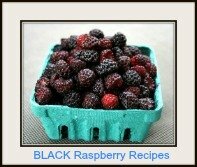 Use the navigation bars at the left side of this website (or scroll down for mobile view) to link to hundreds of recipes with raspberries that are suitable to make for Easter or any time of the year. 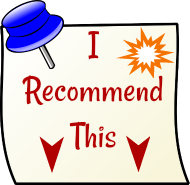 This page will provide links to those recipes which are especially suited for this special time of year. If you are planning on serving an Easter Brunch, why not consider including healthy raspberries in the recipe and create scrumptious raspberry pancakes, scones, waffles, french toast, crepes, or a variety of mouth-watering muffins. Surprise the kids, (and the adults! 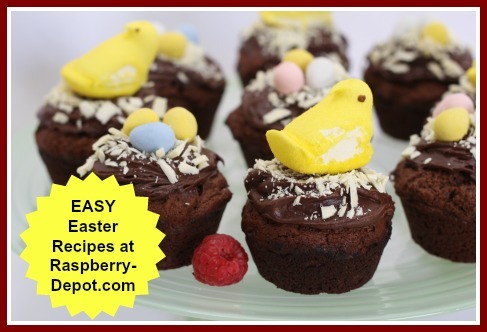 ), with this Easter Recipe for kids muffins topped with "peeps" and delectable chocolate mini eggs sitting atop a nest made of chocolate shavings. This is a very quick and easy treat to make! Raspberry Sauce is always a flavourful favourite to top Easter morning pancakes, waffles, and French toast. Or make scrumptious raspberry sauce to top cake, pudding or ice cream for Easter dessert. If you have chicken or pork on the menu, you may want to try this amazing, colourful Berry Salsa Recipe, made with raspberries, strawberries, and blueberries. This fruity flavourful salsa will get fabulous reviews! cookies and bars, all made with delectable raspberries! If you want to present an amazing colourful salad for Easter Dinner you must really make a Raspberry Salad. Combining fruit, especially berries, with a leafy green /lettuce salad is becoming very popular as a means of adding more fruit to your diet. These salads take the "healthy" in salads to a "new level"! 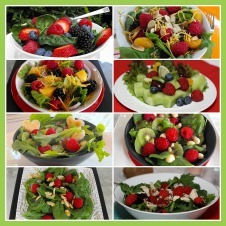 Green salads that include raspberries are not just amazing in colour, but these salads give your taste buds a real treat! 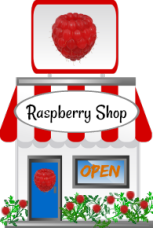 Perhaps you are interested in making a Raspberry Punch, or any other Raspberry Drink, or a Raspberry Smoothie, the fresh taste of raspberries is always welcome in any beverage. you can choose from a great assortment of fruit fondue recipes. Have you been invited to an Easter Dinner Party? Should you bring a gift for the hosts? 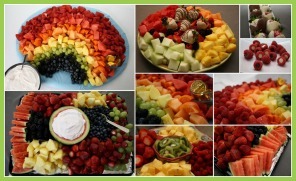 Check out the fun fresh fruit tray recipes if you plan to bring a fruit platter to an Easter get-together. For those of you who are planning on serving fresh fruit with fruit dip, choose from scrumptious dips, but be sure to make a lot, because everyone loves dipping fruit into chocolate, taffy, yogurt and lime fruit dips, and more! Baking and cooking Easter Recipes for Easter Celebrations, (and for all Special Occasions), is always a busy time for the Host or Hostess, but everyone knows that homemade dinner and treats always taste much better than store purchased food! Your efforts are always much appreciated and ENJOYED BY ALL!